As Britain's first and foremost 'crossover' string quartet, Status Cymbal is theString Quartet with it's own distinctive style. Comprising four onservatoire-trained, full-time Professional Musicians, it not only plays the music ofthe great composers, a it has a unique library of sparkling arrangements of all kinds of popular music from Monteverdi to Madonna. 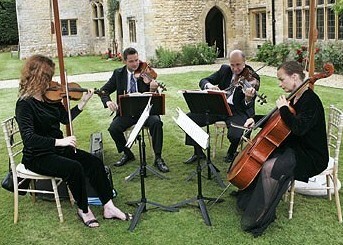 The idea of this classical line-up playing modern tunes delights audiences of all ages and walks of life. As a result, the schedule now embraces concerts, all kinds of functions (they have performed at over 1,350 weddings in their 34-year history), plus entertaining in hotels, restaurants and cruise liners. Status Cymbal are available for Weddings, Corporate Events, Prom Nights and many other events.